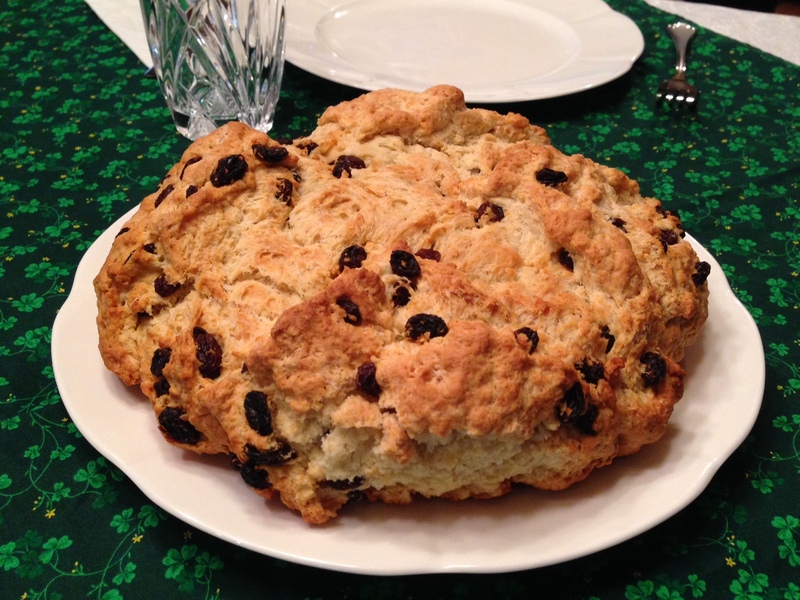 “Challenge Accepted!”, in true Barney style, was my answer when my mom asked me to bring a GF version of my semi-famous Irish Soda Bread to her St. Patrick’s Day Themed Sunday Dinner last year. 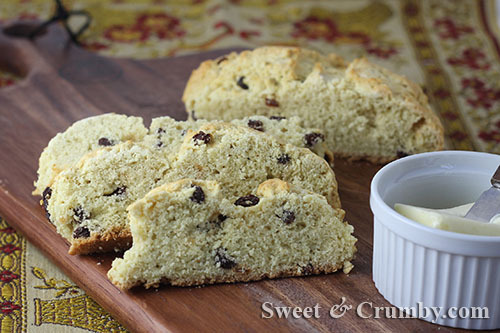 If you have not had the pleasure of being introduced to Irish Soda Bread, then you are a little bit deprived. It reminds me of a giant scone; a little bit crumbly, a little bit sweet, and if it’s done just right then it is still moist and tender. Recreating my tried and true favorites to be GF is fairly nerve racking for me. Although the substitution of my homemade GF flour blend and addition of either Xanthan Gum or Guar Gum has been full proof thus far for any recipe I’ve converted, every time I try a new one, I am found holding my breath and absolutely pinching a bite off the piping hot product the second it is out of the oven. 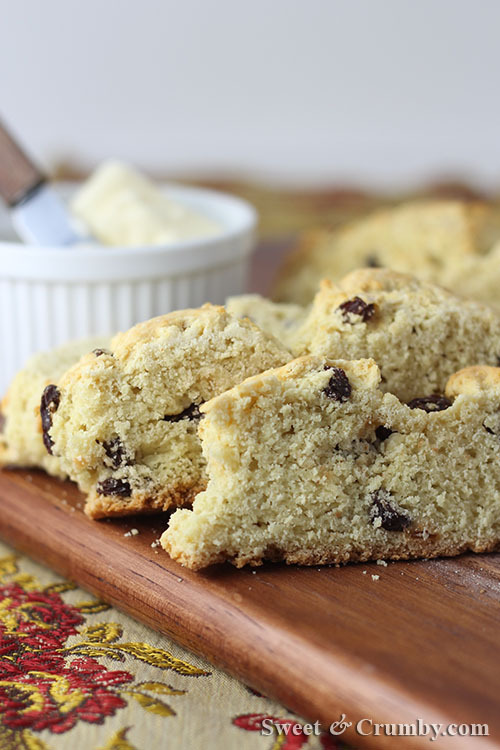 Well this GF Irish Soda Bread is a total winner. I would never even be able to taste the difference in a blind taste. Think Pepsi and Coke taste tests in the 70’s when amazed victims were choosing Pepsi over Coke. I think this bread taste test would turn out quite positive. The crumb is tender and soft and the flavor is lightly sweet and tart (from the buttermilk) and a burst of plump raisins fills your mouth with delight. I have also included an iPhone snap of my original Irish Soda Bread made with All Purpose flour to please GF and non GF eaters alike. Have a Happy St. Patrick’s Day! To make the bread: Preheat your oven to 350 degrees Fahrenheit. Line a cookie sheet with parchment paper. In a large mixing bowl, whisk together flour through salt. Put the small cubes of butter into the bowl and mix WITH YOUR HANDS, crumbling the butter cubes as you mix. This is essential and makes for a very tender crumb with pockets of butter which create air pockets and thus makes your bread light and fluffy rather than dense. Leave your butter pea sized for optimal air pockets. In a liquid measuring cup, pour in your buttermilk and add the egg. Beat together before adding it to the dry mixture. Stir the liquid into the dry ingredients. With the GF version, you can stir vigorously, making sure to adequately dissipate the flour. If you are making the AP flour version DO NOT MIX VIGOROUSLY or your bread will be tough. Simply stir it gently with a rubber scraper. Add the raisins and or currants and stir them in. Knead your bread ten times, either in the bowl if big enough (keeps mess down) or on a floured pastry board. Form into a round dome and gently take a butter knife and make a vertical and horizontal cut across the top of the bread (only about 1/2 inch into the dough). Bake for 45 minutes – 1 hour depending on your oven. The bread should turn a nice golden brown and a toothpick should come out clean when you prick it in the middle of the bread. Categories: Bread, Gluten Free | Tags: GF Irish Soda Bread, gluten free irish soda bread, Irish soda bread, quick breads, St. Patrick's Day bread | Permalink.